The 1906 Ecuador–Colombia earthquake occurred at 15:36 UTC on January 31, off the coast of Ecuador, near Esmeraldas. The earthquake had a moment magnitude of 8.8 and triggered a destructive tsunami that caused at least 500 casualties on the coast of Colombia. The earthquake occurred along the boundary between the Malpelo Plate, formerly considered the northeastern part of the Nazca Plate, and the North Andes Plate. The earthquake is likely to be a result of thrust-faulting, caused by the subduction of the Coiba, Malpelo and Nazca Plates beneath the North Andes and South American Plates. The coastal parts of Ecuador and Colombia have a history of strong megathrust earthquakes originating from this Malpelo-North Andes plate boundary. The greatest damage from the tsunami occurred on the coast between Río Verde, Ecuador and Micay, Colombia. Estimates of the number of deaths caused by the tsunami vary between 500 and 1,500. The rupture zone for this earthquake was 500–600 km (310–370 mi) long, and encompassed those for the earthquakes of 1942 (Mw=7.8), 1958 (Mw =7.7) and 1979 (Mw =8.2). The lack of overlap between the three more recent events suggest the presence of minor barriers to rupture propagation along the plate boundary. Although these three events ruptured the same area of the plate boundary overall, they released only a small fraction of the energy of the 1906 earthquake. The maximum recorded run-up height was 5 m (16 ft) in Tumaco, Colombia. At Hilo, Hawaii a 1.8 m (5 ft 11 in) run-up height was recorded for this event. The tsunami was also noted in Costa Rica, Panama, Mexico, California and Japan. Because the sequence of three earthquakes that ended in 1979 did not release as much energy as the 1906 event, it has been suggested that an earthquake of similar magnitude to that in 1906 was likely in the near future. However, analysis of the amount of slip associated with the three later events suggest that they have released most of the accumulated displacement across the plate boundary since 1906. Finally, on 16 April 2016, a magnitude 7.8 earthquake occurred in the same area. ^ a b c NGDC. "Comments for the Ecuador-Colombia tsunami". Retrieved 7 March 2010. ^ Kanamori, H.; McNally, K.C. (1982). "Variable rupture model of the subduction zone along the Ecuador-Colombia coast" (PDF). Bulletin of the Seismological Society of America. Seismological Society of America. 72 (4): 1241–1253. Retrieved 26 August 2012. ^ Mendoza, C.; Dewey J.W. (1984). "Seismicity associated with the great Colombia-Ecuador earthquakes of 1942, 1958, and 1979: Implications for barrier models of earthquake rupture". Bulletin of the Seismological Society of America. 74 (2): 577–593. Retrieved 2010-03-07. ^ a b White, S.M.M. ; Trenkamp R. & Kellogg J.N. (2003). "Recent crustal deformation and the earthquake cycle along the Ecuador-Colombia subduction zone" (PDF). Earth and Planetary Science Letters. 216 (3): 231–242. Bibcode:2003E&PSL.216..231W. doi:10.1016/S0012-821X(03)00535-1. Archived from the original (PDF) on 2011-07-20. Retrieved 2010-03-07. • Paris, Gabriel; Michael N. Machette; Richard L. Dart, and Kathleen M. Haller. 2000. 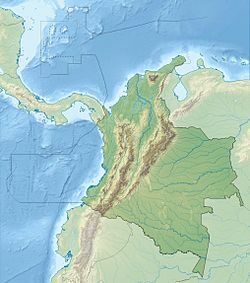 Map and Database of Quaternary Faults and Folds in Colombia and its Offshore Regions, 1–66. USGS. Accessed 2017-06-20. • Various, Authors. 2014. Enciclopedia de desastres naturales históricos de Colombia, 1–21. Universidad del Quindío. Accessed 2017-06-20. This page was last edited on 15 February 2019, at 05:43 (UTC).